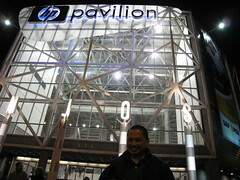 Last night, I was at the HP Pavillion in San Jose, CA to watch Barry Manilow. It did bring a lot of good memories though. I remember many of the songs I heard when I was young. It's funny though coz there are so many gay people (of course), straight couples, and Filipinos. 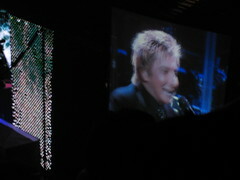 In the Philippines, Barry Manilow is an icon and his songs are standards at Karaoke bars. I did I enjoy it though. Is that gay? Well, it sounds gay but it doesn't sound like something so gay one shouldn't partake of it or it will make you look too gay or anything. 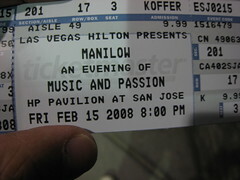 I think Manilow is alright and the many of us respect him for who he is and what he's done (for us maybe?). Actually, I did enjoy it. Brought back lotsa memories. Yep! 10 bucks plus 4 something for convenience. I didn't know you were a Fanilow! It was just nostalgic for me. I don't have it in my iPod. I dunno. I just noticed it over the years. Actually, his songs really brought a lot of memories. So it's okay. It's really that cheap. I think they did it that way so that senior citizens can afford it. Did you see it with anyone? Yeah, with my cousin Bianca and her partner Nova.